John’s scripts have been produced on stage, radio and as audio books. He has won multiple international awards and writing competitions for his work. 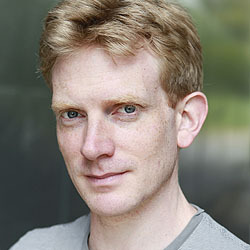 His first full-length play, Cowboys, was a winner of the Royal Court Theatre Young Writers Festival and was produced in the Royal Court Theatre Upstairs. His second, The Golden Fleece, won the inaugural Essex Playwright’s Festival. He was selected by the Royal Court to represent the UK at Interplay, an international young writers festival in Australia. He won the BBC writing competitions Sketch Factor and Laughing Stock, co-wrote three series of the BBC Radio 4 sketch show Recorded for Training Purposes and contributed material to Look Away Now. Since 2009 he has worked full-time for Big Finish Productions, writing nearly seventy scripts for their officially licensed original audio dramas based on popular television shows including Doctor Who, The Avengers and Survivors for release on CD or transmission on BBC Radio 4 Extra. His script Doctor Who: Absent Friends won the BBC Audio Drama Award for Best Non-broadcast or offline drama of 2016. His script The Avengers: Hot Snow garnered a nomination for America’s annual Audie Awards for spoken word drama in 2014. His script Doctor Who: Iterations of I won the International Association of Media Tie-In Writers’ Scribe award for Best Audio in 2015. His script Doctor Who: The Red Lady won the same award in 2016. He has developed a sitcom with Baby Cow Productions, worked as a script-editor on a trans-media project at The National Theatre, and was recently asked to appear on a British Film Institute panel discussing his work adapting a lost episode of The Avengers. Discover how to write exciting, limitless ‘genre stories’ for audio, from sci-fi to horror, from comedy to romance, from the futuristic to the historical, audio drama can be anything. There are so many sessions and activities on offer, LSF is a bit like a ‘choose your own adventure’ story.